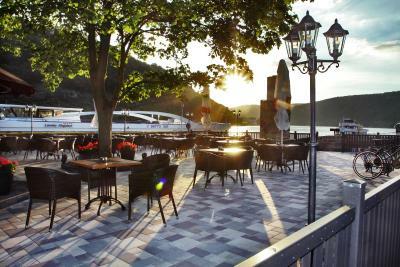 Lock in a great price for Hotel Rheinkönig – rated 8 by recent guests! 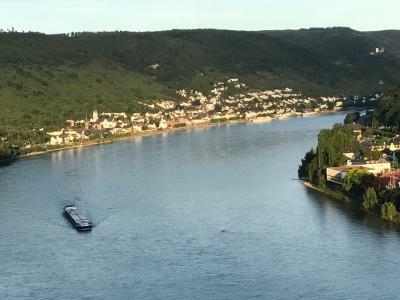 We Love the location to the Rhine river , there is a balcony in which you can watch the ships go up and down the Rhine all day long . We ate several times at the restaurant and found the food and staff to be excellent. 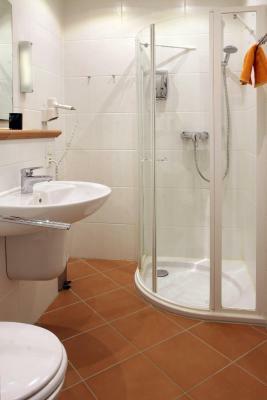 The rooms are clean and have everything you would need. We will return here again next time we visit . I stayed here during a walking holiday along the Rhine. 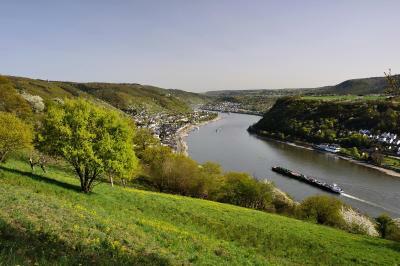 Although the hotel is some distance out of town, it is right beside the Rhine, with no road or railway in between. 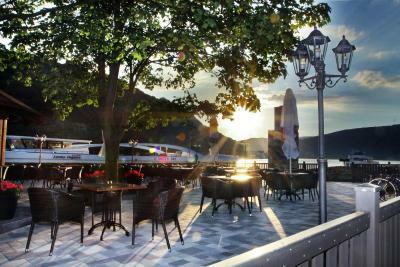 It has an excellent restaurant, with a lovely Rhine-side terrace on what was a warm evening. 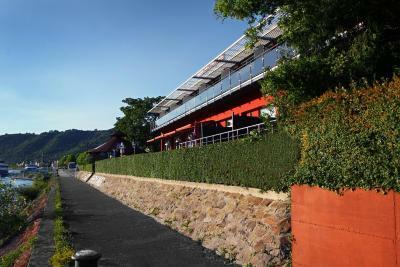 I found the staff friendly and helpful and had a clean and comfortable room with a balcony looking out over the river. I also liked the colourful towels! Lovely, clean family run hotel. Great base for exploring. 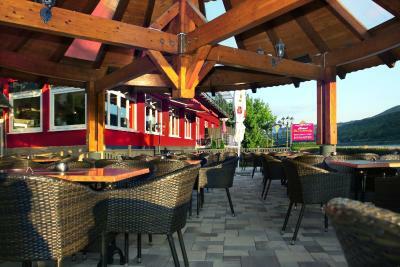 Spotlessly clean & comfortable with tasty breakfast and great terrace to relax on. Next door to lovely public outdoor pool. 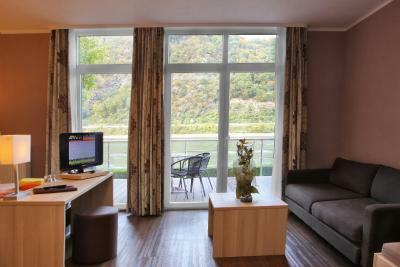 The room is right by the Rhine so great views and you can sit out on the balcony. Very quiet and comfortable rooms. Good breakfast. 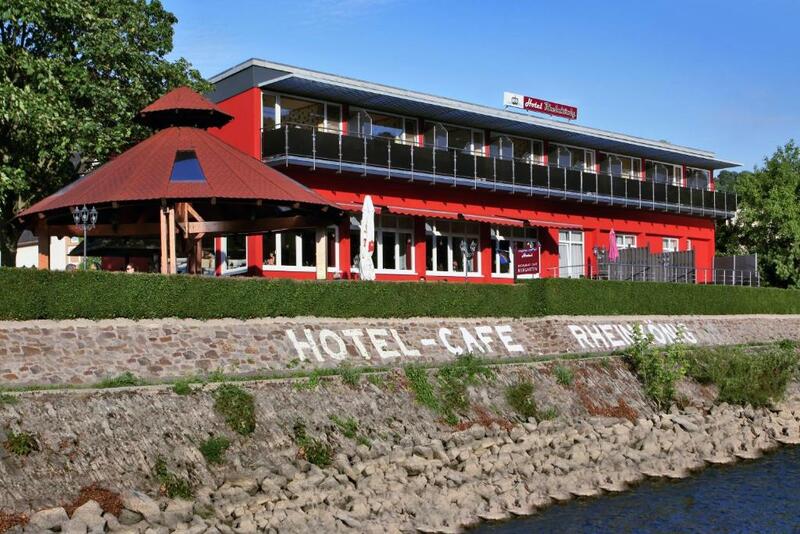 Hotel Rheinkönig This rating is a reflection of how the property compares to the industry standard when it comes to price, facilities and services available. It's based on a self-evaluation by the property. Use this rating to help choose your stay! 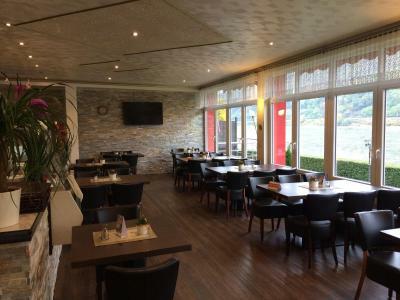 One of our top picks in Kamp-Bornhofen.Overlooking the River Rhine, this family-run hotel is just a 5-minute walk from Kamp-Bornhofen Train Station, in the UNESCO Middle Rhine Valley. 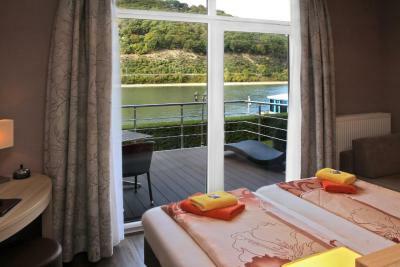 All rooms have either a balcony or a terrace with views of the Rhine. 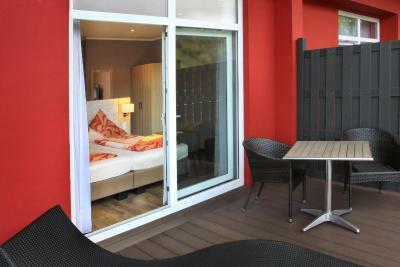 The modern rooms at Hotel Rheinkönig feature stylish décor with a flat-screen satellite TV and a renovated bathroom. 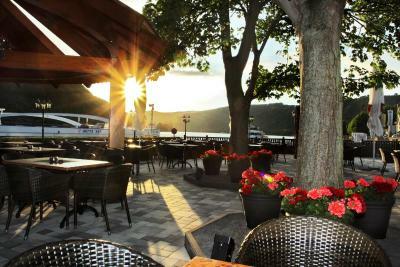 A rich buffet breakfast is offered each morning at the hotel, and the restaurant serves traditional Rhineland cuisine using seasonal ingredients. 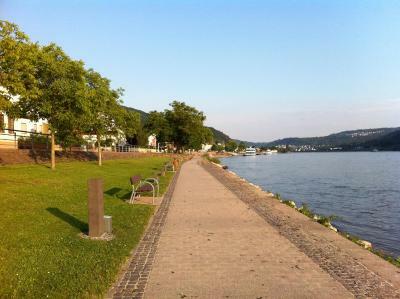 The local open-air pool is just 650 feet away, and the popular Rheinsteig hiking trail can be found 1,650 feet away. There are many hiking and cycling paths in the surrounding area. The A61 motorway can be reached in 30 minutes. 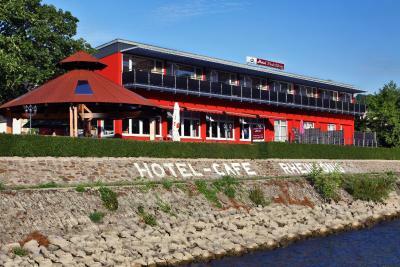 When would you like to stay at Hotel Rheinkönig? Modern room featuring satellite TV and a private bathroom with hairdryer. 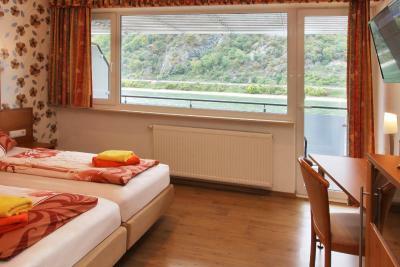 Each room offers a balcony and a splendid view of the Rhine river. Located on the first floor. 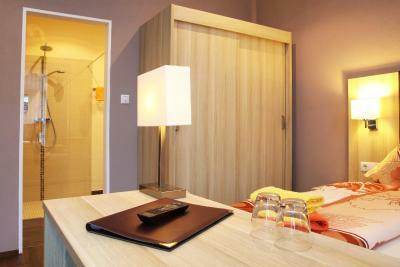 Modern, designer room featuring satellite TV, free WiFi and a private bathroom with hairdryer. This room offers extra space, a terrace with a great view and are located on the ground floor. This family room features a balcony, soundproofing and seating area. House Rules Hotel Rheinkönig takes special requests – add in the next step! Free! All children from 0 to 3 year stay free of charge for extra beds. All children from 4 to 16 year are charged EUR 30 per person per night for extra beds. Hotel Rheinkönig accepts these cards and reserves the right to temporarily hold an amount prior to arrival. They could offer breakfast and little earlier. As a early riser I like to get up and out when on Holiday. 8 am is a little late for me. The trains taking a little getting used to at night. Bring earplugs if you’re light sleeper and you won’t notice them. poor service, no reception, they could not speak any english, didn't take dinner payment by card, breakfast had same stuff every day, cut fruits seemed like canned fruits, not fresh. Senior Lady of the house showed me to the room..literally, opened the door , muttered some German in the corridor and walked off. I didn't see her again until the following night working in another of their hotels further down the road when we ate out at an Italian restaurant, she seemed to have attitude both times. On checkout I believe probably her daughter took my payment after I had to find her as she'd sneaked out to be on her mobile...she continued talking to her phone as she showed me where she wanted me to go. My wife noticed uneaten breakfast food from earlier guests plates be put back on the main spread which was off putting ( bread rolls). The last breakfast of 4- there were cooked eggs on offer, something that hadn't been offered for the previous first 3 mornings. Cakes on display as well on the last day, previously only 1 slice sat there seemingly for the previous 3 mornings. Another thing to note is coffee is in a flask on the table but for tea drinkers there is nothing..not even an offer of one or hot water. Hotel was our last stop after a 4-day hike. 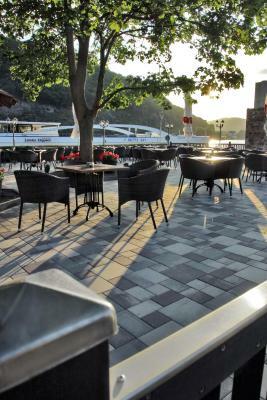 The location on the river is lovely and we truly enjoyed sitting on our balcony and in the restaurant enjoying the view and activity on the river. The server in the restaurant was friendly and helpful. Breakfast was excellent. Overall good value.